I feel I’m going to say this every first of the month but I can’t believe it’s already April! These last three months have been over in a flash so we better make the most of every day guys! 1/This fab military jacket is from Hush. I also love the military overshirt they do and this NLST camouflage vest which is very similar to the one Mila is wearing here but hers was from H&M. 3/This little Gucci bag is right up my street, so cute! 4/My Golden Goose Deluxe Brand sneakers have arrived in time for my birthday butI’m also loving these leather Star trainers, a third of the cost. 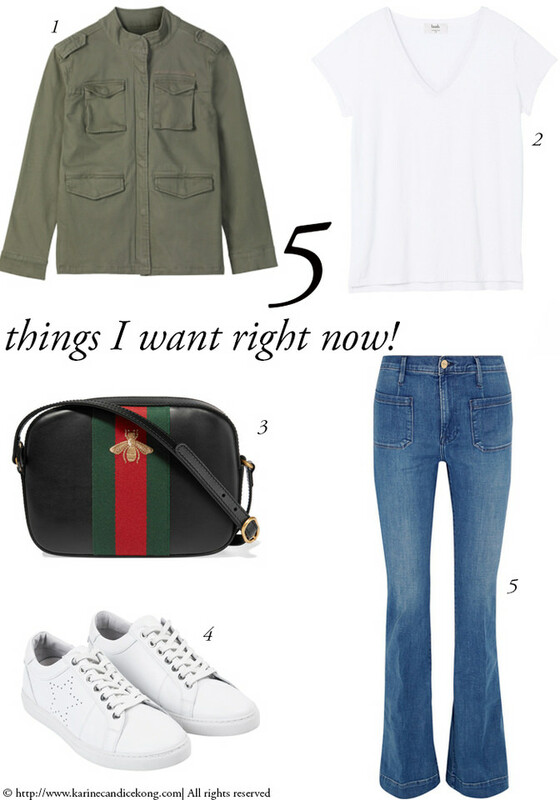 5/and these Bardot flare high-rise jeans to finish the look. Have a fab weekend! Oh yeah!! Love this look and might even find it at home already if I work my way from son to daughter’ s to my own wardrobes! I think with your figure, this is the perfect look for you. I’ve always loved how feminine the flare denim look but never managed to find a pair short enough for me :-) You have long legs! It’s really great post, nice blog..nice post. I would like to appreciate your work and Love it! would like to tell to my friends.